BANGI, 9 August 2010 – Innovation is occurring at such a rapid rate in medicine that safe and competent care today will be unacceptable tomorrow, says an Australian neurosurgery professor. Prof Dr Michael Kerin Morgan, who had been responsible in getting UKM Medical Centre (PPUKM) to be made a national referral centre for neurosurgery, said when he returned from Mayo Clinic in the United States of America, he had followed the way his mentor had performed surgery for clipping aneurysms of the brain. He said if his mentor were alive and to see him today his mentor would find that what he was doing now is something almost unrecognizable from the surgery he had learnt at the Mayo Clinic. 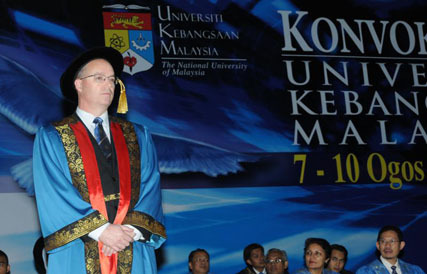 “However, I believe that he would understand and be proud of the changes that have been made,” he said when receiving his Honorary Doctor of Philosophy degree from UKM during the premier university’s convocation on Saturday. 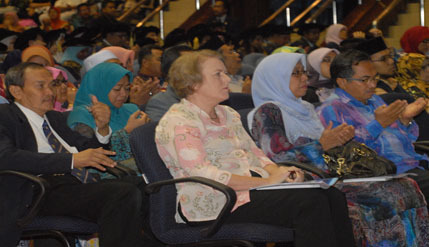 Prof Morgan was first appointed by UKM to be its visiting neurosurgery professor in 1996. Since then, he had trained neurosurgery specialists to perform complex surgery at PPUKM. He had also succeeded in getting the neurosurgery unit of HUKM made as a national referral centre. In his acceptance speech, Prof Morgan said he was most humbled and honoured to receive the award from one of the world’s leading universities. “I hold Universiti Kebangsaan Malaysia and many of their doctors dear to my heart. “To the parents and families, your children have been educated to change the world. That is the purpose of a university and Universiti Kebangsaan Malaysia understands and delivers on this mission. “Universiti Kebangsaan Malaysia is a great university because it has delivered in educating to achieve this purpose,” he said, citing the fact that UKM had produced a total of 4,600 doctors to date. “You should be proud of your child’s achievement but even more proud in how your child is now prepared to make a difference to the world. You should be congratulated on raising and supporting your children for this purpose,” he said. To the graduates, Prof Morgan told them that they had gained great privilege, and that privilege came with responsibility. “You will be held to account for delivering high standards. In medicine these standards are safe and competent care of patients. “However, the challenge to you is to continue to learn through your whole life,” said Prof Morgan, who had obtained his medical degree from the University of Sydney in 1980 and the Fellowship of the Royal Australasian College of Surgeons in 1987 and Fellowship of Mayo Clinic (Department of Neurosurgery) in 1988. He was awarded the doctorate of medicine by the University of Sydney in 1991. Earlier, in his citation on the conferment, Prof Dato’ Dr Lokman Saim, Dean of the Medical Faculty and Director of PPKUM said Prof Morgan is one of most well-known brain surgeons in the world. Brain surgery was no easy task as it required someone like Prof Morgan who was clever with extra-ordinary skill with a patient and calm nature. Prof Morgan, he said, had chosen to provide a special and big contribution to the development of neurosurgery in Malaysia, in particular to UKM. “From the time he was appointed as the Visiting Professor at the Surgery Department of UKM in 1996, he has been training the university’s neurosurgery specialists till today. Many of the neurosurgery specialists had been trained by him in Sydney. “Every year, he would also come to PPUKM to perform surgeries on tumours, cerebral aneurysms, stroke and ‘arteriovenous malformations’ which were complex surgeries, while teaching and guiding the local specialists,” said Prof Dr Lokman. He said that the presence of Prof Morgan at PPUKM two to three times a year had made the UKM Surgery Department as the national referral centre for complex and challenging cases of brain surgeries. He recalled how Prof Morgan was once requested to perform a complex brain surgery on a Singaporean patient and how Prof Morgan had agreed on the condition that the patient be referred and brought to PPUKM for him to perform the surgery. “He is truly a member of the UKM family,” said Prof Dr Lokman. Prof Dr Lokman also said that Kuala Lumpur was the second home to Prof Morgan and his wife, Elizabeth, after Sydney, where he was born. “Through conferences, seminars and lectures, he had reached out to the neurosurgery specialists in Kuala Lumpur, Kota Baru and Pulau Pinang, he is truly a master to the neurosurgery specialists in Malaysia,” he said. Prof Dr Lokman said Prof Morgan was also responsible in setting up the Macquarie University Hospital , which is the first university hospital in Australia. It was through Prof Morgan that UKM and Macquarie University signed a memorandum of understanding (MoU) whereby many young UKM lecturers and specialists had gone and were still going to Macquarie University for training. It was now not only in neurosurgery but also other fields like orthopaedic, audiology, speech science and biochemical that were covered by the MOU, said Prof Dr Lokman.